Prepare your charcoal grill by following these steps. Light the charcoal by following these steps. Wash and quarter the broccoli, leaving the florets in large pieces with their stems intact. 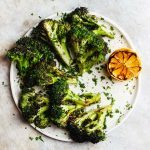 Drizzle the broccoli with 3 tablespoons olive oil and gently massage the florets so they are coated well. Sprinkle with salt and pepper and place on the grill. Allow the broccoli to cook for a several minutes or until lightly charred. Flip and continue to grill the broccoli until all sides are crispy and browned. Meanwhile cut the lemon in half and place cut side down on the grill as well. Do not flip and allow the lemon to char. Remove the lemon once it is charred on the cut side. After the broccoli and lemon are cooked remove them from the grill and put the charcoal out by following these steps. Prepare the sauce by squeezing the juice out of the lemons in a small mixing bowl, and discard any seeds. Next whisk in the remaining 3 tablespoons olive oil until creamy. Then fold in the minced parsley, salt and pepper and stir until smooth. Pour the sauce over the broccoli and serve hot and crispy.